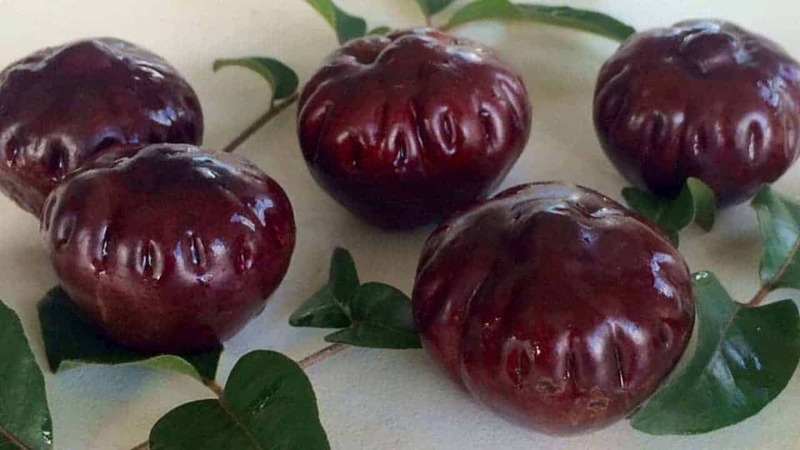 Burdekin Plum, also known as Tulip Plum, is an Australian native that produces plump, acidic fruits that are only edible when ripe. Though it is a rainforest species, it is incredibly hardy and drought tolerant. In the wild, it may also occur naturally on sand dunes behind mangroves and in dry sub-coastal regions along the northeast coast. Fruits are large, black, round and contain a large stone, similar to plums commonly found in the supermarket. The colour and flavour of the flesh varies between varieties, with red-purple plums being tart, while pale greenish-white plums taste more mild. They may be eaten raw, cooked into jams, used to flavour meat, or fermented into wine. Flowering usually occurs between January and March, producing small, yellowish-green blooms that develop into fruit over the winter months. Harvest the fruits when they start to show signs of ripening, but don’t eat them straight away! They are hard and acidic straight off the tree and need to be stored for a few days. Aboriginals were known to bury the fruit underground to assist with the ripening process. Burdekin Plum prefers a sunny position in loamy, well-drained soil. Though it will tolerate drought (and some frosts), it is ideal to mulch and water well for the hot season. It features glossy dark green foliage and a dark grey trunk with rough bark. In the wild, this tree can reach heights of 20m, but is typically grows up to half that height in cultivation. It may be kept smaller in pots, and is sometimes selected as a bonsai species. It is a magnificent tree for a large garden or verge, providing plenty of shade and habitation for birds and small animals. Help! Maggots are attacking my Burdekin Plum. What can I do? Burdekin Plum may attract fruit flies, so it could be worth wrapping individual fruits as they grow. Inspect your tree regularly for fruit fly larvae, and set traps to catch mature insects. What should I fertilise my Burdekin Plum with? Add small amounts of organic fertiliser before the Summer flowering season. When is the right time to prune my potted Burdekin Plum? Typically, you won’t need to prune much in the first year or two, as this tree grows slowly to start. From its third year onward, given ideal conditions, you should notice its growth start to take off. Prune in late Winter/early Spring, just after fruiting season.